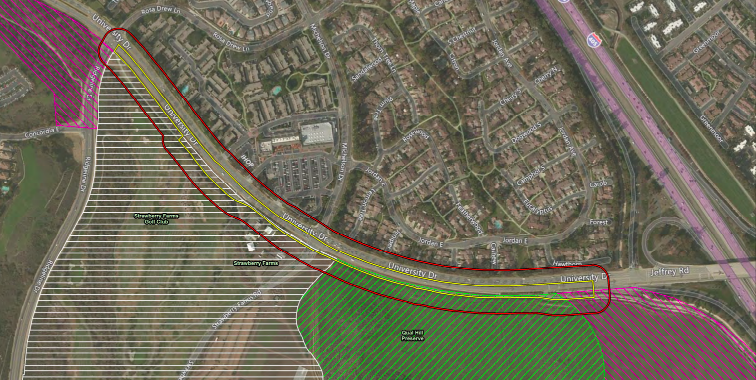 Two Capital Improvement projects are advancing and will help with the severe traffic congestion in this corridor: The University Drive widening project from Ridgeline Drive to the I-405, and the intersection improvements at University Drive and Ridgeline. Here is a brief project description and update. The City proposes to widen eastbound University Drive from two to three lanes, from Ridgeline Drive to the southbound I-405 on-ramp. The project will include an on-street bike lane and off-street pedestrian & bike trail. The project is in the preliminary design phase & environmental clearance. However, the City is fast-tracking the planning & design of this project. For more information please read the Public Notice. The public review comment period ends 12/13/18. Add a third eastbound through lane on University and a second northbound right-turn lane on Ridgeline. Lengthen the westbound dual left-turn lanes on University. The design is completed and the City is now working out the right of way needs. Construction is expected in 2019.